Thunderbirds were definitely Go! 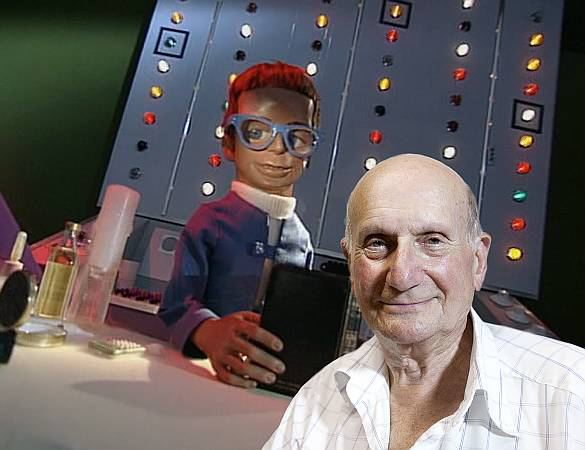 on the warm summer's evening of July 2nd when a packed hall was treated to a spellbinding talk by Gerry Anderson, the creator of iconic marionette shows, including Thunderbirds, Stingray, Captain Scarlet, Fireball XL5 and Supercar. It was particularly gratifying that Gerry had agreed to appear in Wootton (his first talk in public for several years) because he had undergone of couple of major back operations in recent months. Gerry was in conversation with Richard Gregory, a leading puppeteer and animatronics expert, who has worked on several major Hollywood films, including the Batman series and other blockbusters. Richard had brought along a couple of the celebrated marionettes, Virgil and Scott Tracy from Thunderbirds, as well as the vehicles, Thunderbird I and II, which were unveiled to audible gasps as the evening went on. A hushed and reverential audience of both the middle-aged and children listened to Gerry explain how he became involved with puppets and his remarkable relationship with Lew Grade, the multi-millioniare TV mogul , who ran independent television and gave him the financial backing to make some of the greatest children's television shows of all time. At first, though, Lew drove very hard bargains and insisted that the initial show's budget be cut by a half before being commissioned. After staying up all night, Gerry and his team could only reduce it by a third, but it turned out to be enough for Lew and the show was made - and the rest is history, with the two men working closely on many other landmark projects. Gerry recounted a series of fascinating anecdotes, such as the American distributor insisting that his shows be cut down from one hour in length to 30 minutes to help them sell in the United States. After the torture of reduction was completed, Gerry was then told that, in fact, buyers had changed their minds and the shows could be transmitted at their original length after all. Colour versions of the puppet shows were initially only shown on television in the US and Gerry recalled how children in the UK were amazed when they saw the shows repeated in colour, having first seen them in black and white - with one little boy rushing to tell his mother, thinking that each frame had been coloured individually. Clips featuring Thunderbirds and Stingray were shown on the hall's screen and it was significant that their quality had not diminished in the 45 years since first being made, with spontaneous applause breaking out after a wonderful sequence featuring a crash-landing in one of the Thunderbirds episodes. Gerry later revealed how the background music , composed and conducted by Barry Gray, often featuring a 100-piece orchestra, was a fundamental part of the shows, heightening the tension when the action became exciting. The moment that Richard demonstrated the marionettes, pulling strings to make them walk authentically, was greeted with sighs of amused nostalgia and Robin Wheeler, from the Talks Team, did some excellent work in using a camera to transmit the puppet's faces on to the screen, so everybody could see their eyes - which had been such a key part in the development of the marionettes. 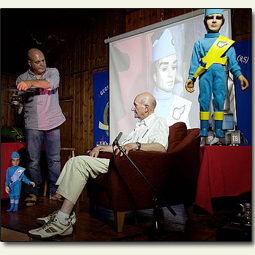 One question from the audience is a regular at Gerry's appearances - the origin of the call-sign "F.A.B" in Thunderbirds. Gerry said that he didn't want to use "Roger" during radio-communication becaue the shows were supposed to be futuristic. At the time, in the Sixties, the word "fabulous" was starting to be used everywhere, but it didn't sound right for pilots to be using it - even the word "fab" didn't have an authentic ring for radio-communication and so they settled on "F.A.B", which doesn't stand for anything at all, but sounded professional. Following the talk, fans who had travelled for miles brought forward a range of items for signing, including Thunderbirds toys, original books and even the posters advertising the talk in Wootton. Gerry - sitting in an armchair because of his back operations - patiently signed everything given to him and both he and Richard said afterwards they had thoroughly enjoyed the evening. They were amazed that they had spoken for over 90 minutes, with the time flying by so quickly. Proceeds frm the evening were £561, giving a total of £10,576 after nineteen talks.